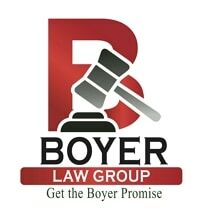 If you or someone you love sustained an injury in an accident caused by another individual or business's negligence or your insurance company has denied your claim, the experienced attorneys at the law firm of Boyer Dawson & St. Pierre will fight diligently to protect your rights and secure your financial future. We listen and care about our clients and this enables us to win. If you are interested in learning more about how we can help you, we invite you to schedule a free initial consultation at our law office or your home or hospital. Boyer, Churilla & Dawson, P.C.